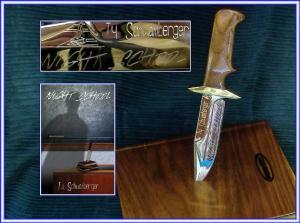 The Night School Knife/Book Set originally debuted about a year ago. And as I was recently looking over at the Storefront (where you can buy all sorts of cool stuff), I figured that it was time to mention it one last time. So, if you are a knife, book lover or both, you better hurry up and order one, today. Click here for details about the custom-made knife/book set and how you can go about ordering one. The offer for this limited edition set ends forever on April 30th!